Over the last year, Dubai’s construction industry has been influenced by a diversity of socioeconomic headwinds. Fluctuating oil prices to the deployment of VAT has meant that top developers, contractors and consultants have had to stay agile in their business operations. At the same time, there are incredible projects taking form in Dubai and across the country. The construction market remains a key driver of the UAE economy, and mega-projects continue to attract attention from the world’s most prominent construction firms. One of the companies at the forefront of that positive trajectory is UAE-based ASGC Construction. Recently earning Big Project’s “Contractor of the Year” award, the company has managed to capitalize on new opportunities by rethinking the traditional tools and processes of the sector. Over the last 30 years, ASGC has become well known as a full-service contractor for delivering landmark social, cultural, commercial and living projects. Amongst its most notable projects in the UAE are City Walk, Etihad Museum, Bay Square, Golden Mile and Waldorf Astoria. Further abroad, the company has also taken on exciting projects in Egypt, including residential units in R3 and R5 Districts in the new administrative capital in Cairo for the Ministry of Housing, as well as four commercial buildings in Emaar Misr Mivida development. Part of the company’s success is down to its ownership of the majority of its supply chain, and the use of mostly in-house resources, giving it a high degree of control over project quality and timely delivery. This is underscored by a commitment to exceeding customers’ expectations through the application of cutting-edge technologies and operational practices. While there is no doubt pressure on the UAE construction market at the start of 2019, ASGC is doubling down and expecting a fruitful year ahead. In particular, Big Project looks at four of the landmark developments coming online from ASGC in 2019. Being in the market for three decades, ASGC is well positioned for the future. With huge investments in integrating technology, innovation and empower the employees, the company is aiming to continue its growth momentum to expand to new regional markets and affirm its commitment to supporting top regional developers. Travelling through Terminal 1 at Dubai International Airport is going to get even easier. The experience must live up to the expectations that discerning travelers have of Dubai International Airport, one of the busiest air travel hubs in the world. This was one of Big Project’s shortlist nominations for “Infrastructure Project of the Year” in 2018. The project scope includes improvement of Concourses C and B, upgrading a number of aircraft stands, and airfield improvements within the stands. The project also includes refurbishment of BHS Halls C & D, the ever-popular Dubai Duty Free and the Control Tower. Dubai International Airport Improvement Works is a DAEP project being constructed by ASGC and the consultant is Dar Al Handasah. This eagerly-anticipated entertainment destination has garnered a lot of public attention over the last year. Located at City Walk, the state-of-the-art, multi-purpose arena spans an area of half-a-million square feet with an approximate capacity of 20,000. Coca Cola Arena is set to enhance Dubai’s leisure and entertainment offering and become the ‘go to’ venue for large-scale international music concerts and sporting events. Coca Cola Arena will be the only all-purpose indoor air-conditioned arena of its size in the entire region and will boast an advanced infrastructure allowing it to accommodate mega events. Coca Cola Arena is a project by DXB Entertainment and is constructed by ASGC under a Design & Build contract. Located in Al Jaddaf and adjacent to Dubai Creek, Dubai’s multimillion-dollar Mohammed Bin Rashid Library is nearing its completion. Final touches are gathering pace on what has been described as the largest cultural and library project in the Arab world. The 92,903 square meter development will include a 500-seat theatre. It will house more than 4.5 million books, 1 million audio books and 2 million e-books. The library will also include several areas for public interaction, events, activities and educational and cultural festivals. Mohammed Bin Rashid Library is a Dubai Municipality project being constructed by ASGC and the engineer is ACG. 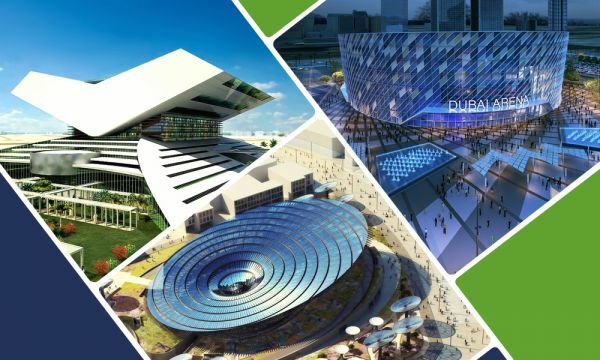 Earlier in 2018, ASGC was awarded the construction contract for Expo 2020’s Sustainability Pavilion, which is set to be completed by Q4 2019. The pavilion will exceed Leadership in Energy and Environmental Design (LEED) Platinum standards and will be the centerpiece for the Expo’s green theme. Constructed over 29,159 square meters, the pavilion will be adjacent to the Sustainability Zone at the Expo 2020 Dubai Site, acting as a primary anchor to one of four main entries to the Expo site. The plot for the Sustainability Pavilion comprises a broadly triangular area of 180m long, by between 75m and 200m wide. One of the unique features is that the pavilion will use Photo Voltaic Panels to generate 4GWh of electricity per year, which is roughly enough to power 300 to 400 homes within the same time. Excess power will be fed into Dubai Water and Electricity Authority’s grid. It will also produce up to 22,000 liters of water a day, extracted from atmospheric humidity and grey water recycling. The Sustainability Pavilion an Expo 2020 project being constructed by ASGC and the Project Manager is Turner.